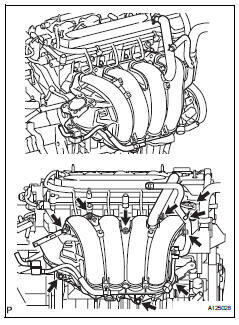 Remove the heater water inlet hose from the heater radiator unit and cylinder head. Remove the heater water outlet hose from the heater radiator unit and water by-pass pipe. Disconnect the union to check valve hose from the brake booster. Disconnect the camshaft timing oil control valve connector. Remove the wire harness clamp. Remove the union to check valve hose from the vacuum hose clamp. Remove the 5 bolts, 2 nuts and intake manifold. Remove the gasket from the intake manifold. Remove the intake manifold insulator from the cylinder block. Remove the nut and sensor.